This year, I have decided to get older. For some years now, I have been 47. It was a good age. 47 is, of course, a prime number, a befitting age for someone in their prime. But--a problem has come about.. I claim to be 47—but passing for 47 is getting harder with every grey hair! Another issue is, I have friends who really are (but don’t look it!) 47—well it’s a bit of stretch to look at both of us, and convince yourself we are the same age. I don’t want to force them into lying about their age. Now I took to knitting like a duck to water, but it’s pretty hard to believe that I was so precocious that I was knitting before I was born. So Tomorrow I am going to acknowledge that I am no longer 47. So I’m getting 5 years older tomorrow. Good bye 47, Hello 53! A bit of both today. Here are the socks, with the fair isle heel flap(s)almost half done.I should finish them up today and maybe even get the turning done. The good news—I had enough yarn to get the third button hole completed in the lovely multi-color yarn.I could have done 1 more row, --but then the color change would have shown on the outside of the sweater. I cast on in the solid purple, and made a neat color change there—So a neat color change was in order for the bottom edge. 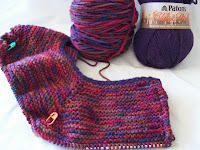 The pattern calls for a single row with some eyelets (increases)—further down, but since my ‘plan’ was plain garter yoke in multi color yarn; with the lace in solid purple, I am making a small modification. lacy—and makes the two tone design a bit consistent—Fancy yarn, plain garter stitch—Plain yarn, fancy stitch work. Only late last night, in my haste-- I messed up! The row of beading was done on the wrong side, and yes, it does matter! The best news is, after the increase, I will only need 4 more rows and I then I can divide the work (and reduce the number of stitches per row!) and start the lace..
What's change? Where do I stand today? Good News! The garter is done! On to lace! Off with sleeve (stitches)! On with something thing more interesting than endless rows of knit stitch, who’s only respite was an increase (or 8) every other row. It's not really a delicate lace-- it will stand up to being tugged on.. and stand up on its own, above the ribbing. Black yarn obscures all the details.. but the lace? It's a pattern of 3 row buttonholes! In the long history of knitting, most knitting in the round was done on DPN’s. New knitters are often afraid of working with DPN’s—but find, once they try, they are not nearly as hard as they thought they would be. (different countries have different conventions!) But knitters are not limited to using these numbers. It is quite possible to use 6 or 7 DPN’s at a time in a single project! Circular needles are a rather new invention—the earliest circ’s had metal cords that resembled piano wire. The cords were stiff—and needed to be used with care, since the wire cords could (and did) break--leaving a rough edge that snagged each stitch. By the 1960’s, new circ were introduced with nylon cords. These cords were stiff (by todays standards!) but they were more durable and much easy to use then the wire cords. Today, circular needles come in a range of materials*—and the worst of the cords (Boye brand) are still 100 times more flexible than the old ones! Most knitters today will use Circulr needles to knit in the round—especially sweater or other garments.. Few knitters still use DPN’s for large items, and its not easy to find sets of 14, or 20 inch long DPN’s, since so few knitters use DPM's for sweaters, or shawls, or other items. The ready availability, and reasonable cost of circular needles, means most knitters will use circular needles to knit in the round—And that some knitter use Circs almost exclusively—for both circular knitting and flat knitting. 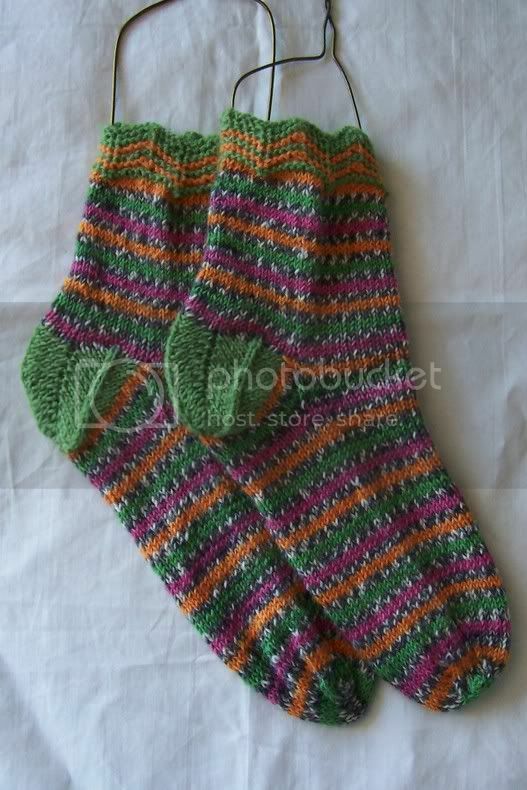 Sock knitters are one of the converts--today, many sock knitters knit socks 2 at a time on 2 circular needles (often called 2 on 2) and others knit their socks on a single long circular needle using the "Magic Loop" method. What is hard, for many knitters, is grasping how to convert their knitting/or knitting patterns from one method to the other. I will show you how to work your way from a tube of knitting worked on 5 DPN’s (a box like shape) to a tube worked on 4 DPN’s, (a triangle) to a tube worked on 2 circulars, to a tube worked on 1 circular..
4 of the markers should be numbered (1, 2, 3, 4)—you can buy or make fancy ones (like these) or use something like those paper disks used to mark keys. These markers, (and this tutorial) will help you understand no matter what number of needles are used, the process is really unchanged—and by using markers, you’ll be able to easily use any method for any pattern. I didn't mark the stitches/needles as I worked--and you don't have to either... it's just an option. Step 3—Change to a set of 4 double pointed needles. C—Put the now unneeded 5th needle away. At this point you have an uneven triangle. The needles form a triangle than can easily be collapsed. Needle 1 and needle 3 each have 12 stitches, but the third needle (the center needle) has 24 stitches. If a pattern called for working on a set of 5 DPN’, and you only had sets of 4, you could easily ‘combine’ 2 stitch groups onto one needle—and either make a mental note when reading the pattern, or you could mark the stitches groups, and have a visual reminder of which stitches are the needle 2 group and which are the needle 3 group. Step 4-- Next round, start by working stitches on needle 1 with the spare DPN. Finish the round working the stitches on the last needle onto the spare DPN. The stitches on the circular needle can be worked by sliding the stitches to left tip of the needle, and bringing the other end of the needle round to be the right tip. Work the stitches from the circular needle, onto the same circular needle. This is easy to do with any length of circular. Finish round by working the stitches on the last DPN onto the second Circular. And then begin the next round by knitting the stitches on the remaining DPN (needle 1)onto this circ. The beginning of the round is centered of one of the circ’s. Normally when I switch from DPN’s to 2 circs, I end up with the BOR as the first stitch on one of the circs. No matter how you have divided the stitches, each Circular needle holds half the stitches. When working, the stitches on the unused needle are moved to the center (cord portion of the Circ.) Always, the stitches are worked from 1 circular needle ONTO the same circular needle. In the beginning, it is helpful to have 2 different circular needles (either different materials, or different colors, or different lengths)—what ever works to help you keep track. Step 5—the last step is the easiest. Using the longest of the 2 circ, work all the stitches onto the single circ. The stitches are kept in 2 group-- A loop of the cord pulled to divide the stitches—as they are worked, the loop is continually recreated. When one group of stitches is being worked, there are 2 loops of cord –one at each side of the work. At the end of a round (or half round, there is a single loop one side of the work, and the 2 tips of the needle at the other side. This style of working in the round is called Magic loop—and with a magic loop a small number (48!) stitches can be easily worked on a long (36 inch or longer) circular needle. A knitter could have ONLY 36 or longer circulars, and work any number stitches –from 4 to 400!--on a single circular needle. As the number of stitches increase, the loops will get smaller and smaller until they are no longer there at all! Keeping track of which stitches are the needle 1 stitch's, and which stitches are the needle 2 or 3 or 4 stitch's gets easier with each project. But numbering the groups of stitches to correspond with ‘needles’ allows even a newish knitter to convert any pattern to this style of work. Once you understand the different methods of working in the round, you can cast on and start knitting in that method--the interum steps here won't be needed! *Circulars are available as single needles, and as sets of interchange able tips and points. If I were starting out today, as a new (and in need of equipment) knitter—I think I would be buying some of the new interchangeable sets on the market.. ones with super flexible cords, and strong but easy to connect joints. The cost of set of interchangables vary—but the range is from about $50 (US) to $100(US) –and each set is substantcially less than buying the same brand of needle individually. Every knitting forum that exist has any number of thread about the relative merits of each set. Most sets, (used) retain about 90% of there value, and can be resold on Ebay or craig’s list for just a bit less than what you paid for them. So its not a bad investment to buy a set, any set and see if they suit you. Recouping your investment is not that hard! And you would just cast on with out giving it a second thought, and not insist upon, a not particularly hard cast on (Judy's Magic Cast On) –but one that requires a bit of attention-since I was doing the cast on as reverse stocking knit, not stocking knit. The cast on was done in Patons Classic Merino, as will be the lace (and perhaps the last few rows of the yoke!) The lovely yarn from Kelly is a full 4 ounces—but i don't know how many yards—and it's just the 1 skein.. so lets all keep our fingers crossed that we make it to buttonhole 3—and maybe a row or two more! Learning to knit in the round is a perennial problem for new knitters—Every knitting board and forum has the same basic questions being asked time and time again. So lets go over the basics. These come in size (US sizes/mm sizes) and lengths. The common lengths are 5 inches to 14 inches –with 7 to 8 inch long ones being the most common. DPN’s commonly come in set of 4 needles and in sets of 5 needles--today sets of 5 are more common, but there are still companies that sell sets of 4. But they can be used, in sets of 6 or 7 or 8—by buying 2 or more sets. Circular needles are (think about it!) another form of a double pointed needle! The commonest lengths are 24 to 40 inches. Nylon, plastic (various sorts of plastics) and glass and so on, because this list is far from complete. Circ’s, also come in INTER CHANGEABLE sets—there are lots different sets and complete discussions about the various sets is an other whole essay! The sets consist of tips (about 6 inches long) that screw or snap on, and cords of various lengths that can be use, as is, or joined together to make any length cord desired. Most set include connectors (to connect the cords) and ‘buttons or end caps” that allow you to use the cord as a stitch holder, by removing the knitting tip(s) and replacing it with a button/end cap. Set come in different material, and different ranges of sizes. Most set can be, (if you find you don’t like something about the set) resold on ebay or on swap forums for about 90 to 95% of what you originally paid for them. A single LONG length circ can be used—for any number of stitches--even very few –by using a method called Magic Loop. Circs that are 40 to 47 inches long are the most common size for Magic Loop knitting, but in some cases, a 32 inch needle is long enough. The disks can be flat (perfectly!) or NOT. Doily’s, shawls, placemats, “pinwheel’ blankets and other blankets are some uses for flat disks. Beret’s are make from flat disks, too. Uses for cupped disks are hats, or knit (and felted) bowls, or other shaped items. Cupped disks often turn into TUBES. A disk that has excessive increases wil ruffle, and flat disks can be trimmed with ruffles. There are some general guidelines for making disks, and some general (not perfect, but general rules) for the number of increases or decreases needed to create a flat disk, vs a cupped one vs a ruffled one. This information will be in a future post. Tubes can be straight, or tapered or even something like an hourglass shape. Both methods can easily be combined. A hat is a Tube with disk (usually a slightly cupped disk). In some traditions of knitting, one method is more common than the other, but both methos (styles) work and both are ‘correct’. More about knitting in the round tomorrow. Something—I hope! There are thousands of ways you can help make this world a better place. Oh, yeah, I finished the socks. They look nice—to me, they are nothing special--and likely to be worn sometime before I cease wearing socks (for the summer)—I don’t totally give up on socks for the summer—I have a half dozen or so cotton or cotton blend socks—but I go bare foot as often as I can. I really enjoyed having the few extra yards of the Lemon Drop color way to add--Thank you to the Lion Brand Studio for making it available! The sock is a bit of mish-mash--mostly plain... I cast on (long tail) in Lemon Drop, and then switched over to the Rock Candy grey for a bit of a brighter edge to the Latvian twist on the top of the cuff. The two colors worked up differently in each heel--since I made no effort (at any point!) to have the subtle stripe match. 2 color linen stitch is a strong dense heel stitch--that will be shown off in clogs as often as its tucked into shoes--and will never wear out! The toes are just a simple stripe--and again--interesting how they change the look of the main colorway. The whole sock is sort of a study of how the two colorways play together. I dreamed of being grown up-- of being rich, and famous, and understood. I was going to be a writer, of course—and live alone, high on a hilltop, looking out at the mountains. I wasn’t sure what I was going to be writing—but I suspect it was poetry. While I have worked on and off at writing –both professionally and for my own pleasure—it’s not something I has made me rich. Or famous. Today, with 16 followers to my blog is about as famous as I have ever been—which makes me a very small fish, in large ocean! As for being understood—well I have learned to be more understanding. I am a bit less self-centered. Change is hard, and even when I embrace it, I still often find that I get dragged along rather than gracefully accompanying it. What I never dreamed as a child is what I am doing. My life is very different than my parents lifes, and very different than anything I imagined. I still live in the same city I was born in. I’ve moved around inside of NYC—but I’ve never left it—I doubt I ever will. I love living here. And while I love and in awe of the mountains—I can’t imagine living in a rural location. I am one of those people that makes Wyomingers happy.. I want to come visit—enjoy the views--and then go the hell away!.. (I am happy to leave it empty once again for them. )—I count Wyoming as one of the prettiest (what a trite word for the majesty of Wyoming!) place I’ve seen.—but then, I love to travel, and there are very few places that I have loved visiting. I saw movies and television, and my dad even owned a movie camera, but home movies are not quite the same as YouTube.---and I have come to really enjoy YouTube—even if I am just barely able to make it work for me. But more than anything-- what I am loving about technology today is the interconnectedness… How this(1) is connected to this(2), is connected to this(3), and this(4) and this(5)and this(6) and(follow the right path on the last link, and you'll find me at the end! And this is mostly just the technology side--slip over to the art side, and a whole new set of connections develop—and collide! For myself-- I get so little use from them. I am never cold –unless I am sick, and then I am more likely to cuddle under a blanket than wear as sweater. My co-op apartment is usually so overheated I never need a sweater indoors. I hate the bulk of sweater sleeve under a coat (not that I wear coats often) —but I do knit and wear vests. I wouldn’t want a sweater at all—but I have been working in the ‘front desk’ of a computer café—one with out heat—but even if it had heat, every time the door opens, there is, (well there was) a blast of cold air. And I have actively wanted a sweater many days this past winter--Come summer, it’s the opposite--the door is left open to catch a breeze!—But winter will come again, I will need and want a sweater—again! Amy made one, and so has Rena, and so has Kelly—and each has been pretty than the next. So I pretty much decided--I was going to make one. I have yarn enough—(for a dozen sweaters!) but—mostly boring solids. I have some hand painted yarns--but nothing in worsted—and not enough of any to do a whole sweater. Then yesterday, Kelly was showing of a huge (one of those glad EXTRA Large storage) bags of yarns she snagged at a garage sale. It contained goodies like 900 yards /double stranded (mohair and rayon)/hand painted + other hand painted wools (2 and 3 huge skeins)—and then this odd skein.. that cried out to me. Kelly looked at it and said ‘Eh—its nice, but look at this…” and pulled out another hank of beautiful yarn. And I told her.. 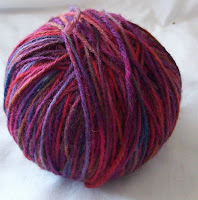 I am stealing this skein. I told her.. It my birthday (not for another 10 days—but…) and she said Keep it! So now I have a beautiful skein of mystery yarn to knit the yoke—and as for the body? Maybe the light grey I had original planned? Or should I match up the dark teal that the hand painted features? Or try to match one of the rose or ruby reds? I will let some skeins out to play with the handpainted, and see which colors play well together! I can hardly wait to get started! First—of course—I need to finish the Grey socks.. –another inch and I’ll be shaping the toe. Tuesday will be 3 weeks that I have been knitting them-- Enough, already! Pretty little paper books –made from recycled calendars..
One of my stated goals--since I started back to work--has been to replace my (the original 1960's installed when the building was build) wall hung bathroom lav with a new one.. something else I haven't done! I haven't even bought a new lav or vanity or the new hardware. Most of the Cast on’s I have demo’d with YouTube have been straight line cast on. Straight line cast on’s, can be, of course, joined into a round—and used to create a tube—some (the stretchy ones) are quite suitable for socks or hats. Hat, Doily’s, Shawls--and a host of other knit objects start with flat or shaped disks. Round 1: K1, YO, (4times) 8 stitches. Some patterns with 8 –instead of 4, or 6 or 10—but all these directions are maddeningly difficult--a straight cast on, of 8 stitches, joined into a round leaves a big messy hole. How do you get a neat start with 8 stitches crammed into the center. And trying to manage 4 DPN's (each with 1 stitch, or 1 stitch and a YO!) is no fun either! How do you manage 4 double pointed needles with just 1 stitch on each!? I know EXCELLENT knitters who have spend an hour our more starting—redoing, and redoing a cast on—working hard to get it neat. One solution: the Emily Ocker cast on. This is a great cast on.. but it often feels like you need 3 hands to get it done--I've done it.. but it is VERY fiddly! Easier than the Emily Ocker, but it starts with a slip KNOT --not something I want--especially in super light yarn and lacy shawl. My solutions: the Loop cast on. I’ve made video after video—and each time, I’ve had small ‘mishaps’ –I’ve forgotten yarn overs—I have been out range, or out of frame (I make my video’s using a tripod (between me (my body) and my hands and sometimes it really gets in the way—and the knitting goes to the south of the framed image or to the north! This video has a small mishap or two... a strand (from a round worked as I cord) get caught in front of the work—and I just move it to the back--and at one point, I lose my working yarn! I left these mishap in—(and several other jumbles) because I think its important for newer, or newish, or just new to this cast on knitters, to see, while this cast on is easier than some, it's still a bit fiddly.. And I have fiddled with it a bit. The Video is long (almost 11 minutes!) And you may need to watch it a few times to get the process –But I think its general faster (to learn and to do) and prettier (than any straight cast on joined) and with a bit of practice EASIER than any other eyelet cast on. So if starting that shawl with a cast on of 4 stitches, and Round 1 of K1, YO –has left you saying, NOT TODAY… then maybe this will help. This cast on works for Cast on 4, Round 1 K1, YO (4 times) and it works for Cast on 6, cast on 8, or cast on 10 (any even number) --and it gives you a beautiful tight eyelet each time. Now that you've read all about--give it a try. Warning! it is an 11 minute long video. Since I didn’t do much knitting over the weekend. This is a busy week for me—so this weekend I did a lot of prep work. Need I say it? -- I am a bit obsessive about coffee. I freeze coffee ice cubes (actually ice bullets... big chunks!) And pre make my coffee and chill it (I drink ice coffee year round.) this way I have cold, non diluted coffee. One 1 pot of coffee became “coffee ice cubes” and the other pot is left liquid. I got oatmeal made too. Since I like to have oatmeal for breakfast, and being picky, I want slow cooking steel cut oats, not mush quick oats.—and I am not willing to spend 45 minutes cooking it each day.. So much easier to make a big pot, and portion out servings to reheat each day. Fruits are the third component of my breakfast—but the easiest... NYC is blessed with lots of fruit stands. I can buy ahead and schlep fruit to work. Or I can buy fresh every day on the way to work... (I do both! )—and I do it both ways—I sometimes schlep home fruit for an after dinner sweet. So breakfast for the week is taken care of. Clothes too... Laundry was washed, dried, folded and the all too important last step PUT AWAY was done too. The weather here has been normal –one day spring like, one day as warm as summer, one day blustery as cold as winter. It’s the time of year that requires a range of clothing—and some days, layers (donned or discarded) as needed--its hard on planning... and it means both wintery and summer wardrobes. I did some grocery shopping too, -- And precooking. I hate to have more pots to wash then diners—and since I often dine alone. I don’t want more than 1 pot—which can be limiting. I started the weekend by renewing my driver’s license. –Every ten years its new photo time and new eye test –well driving license eye test. I get my eyes examed more frequently than once every 10 years! And I am still working on some special projects—no single project is very time consuming. But all together—it’s enough to keep me busy! Are now done-- And 1 heel has been turned, (and the first of 4 sets of gusset stitches picked up)–as of 7AM. Now, (mid morning) the second heel is turned, the second set of gussets have been picked up and I am back to working in the round . The flap is 3 inches deep, (not unusual) but the linen stitch is dense, row wise—I picked up 26 to 27 stitches (1 per chain) along the edge (not the expect 16 to 18 (for a 32 stitch heel flap) so the gussets will be extra deep. Likely, I’ll decrease 2 rows, then skip a row (8, not 6 decreases every 6 rounds) other wise the gusset will extend almost to the toe! I am very happy with the way the colors of the two yarns interplayed. Light grey some times came before or after the light olive (and the two shade are so close—its hard to tell them apart.. in other places the light taupe came close to the golden brown-- The heel flaps show the interesting kind of color play I hoped to see in the Latvian braids—not that they look bad, its just I didn’t make any effort to start the socks at the same place in the colorway, and I did the same with the Lemon drop yarn—I just started at the end.. and made no effort to cherry pick the colorway for the most optimal intersection. Sometimes I do make this effort (a clear stripe, vs. these sort of stripes) are likely to be perfectly matched) but sometimes its fun to just let the yarn take charge. And while I take the subway regularly, (and not too infrequently meet other knitters) I’ve never met a knitter or crocheter from Ravelry –or--more specifically, any one from Ravelry’s Subway knitters group—except when I have planned to do so. This week, two different knitters (women of a certain age/ (that is to say, older than me!) both were interested in my socks. I had to opt for a 2 color linen stitch for the heel. It looks fine--but it is slow going—the linen stitch is pretty dense—which makes it durable (and a great choice for heels or toes.) if slow. It would go faster if I knit more. I really can expect much progress when I only work on the socks on the subway, and then only on the way home—mornings are reserved for glancing at the headlines, doing the crossword puzzle, and then actually reading the news. And by Thursday, when the puzzles are getting harder. (they get progressively harder, everyday, with Saturday’s being the hardest—Sunday’s is bigger, but it has a title that gives you a clue to a theme.. and that makes it easier) I don’t always finish the crossword in the morning ride. So I have scant inch of knitting to show for yesterday’s work. A big, almost full moon was shining so brightly, I woke me. It won’t be full till 10 am tomorrow—10:56am to be precise. (I just checked with the NYTimes for the exact time. The Times is a newspaper that I love because it has astronomical information, (when the sun rises and sets, and the moon, and Venus, Mars, Jupiter and Saturn—(well, information about which ever planets currently visible) And it doesn’t have astrology! Yes, I know the sign of the zodiac I was ‘born in’ –both the western/European system and the Chinese system. But I think that it’s silly to think these things have any effect on my life! I have also been informed that today; April 8, 2009 is the first day of a 28 cycle. We in the west tend to use the solar calendar, but many cultures use the lunar calendar—in general they don’t coincide. Since a lunar month is 28 (some odd) days long, (about 28.5) and 28.5 goes into 365.4 (a year) 12.5 times. This is why some years, we have a 'blue moon' 2 full moons in a single calendar month--since calendar months are, except for February, longer than lunar months. Getting solar years and lunar years to 'line up' is not an easy thing! But after 28 years, the cycle begins anew—Cycles like this are almost never part of our lives anymore—We keep time by minutes and hours, days and weeks printed on calendars.. The Sun and moon, and there cycles are a lost art to most of us. Do you know how the date for Easter is decided? Easter Sunday is the first Sunday after the first full moon, after the equinox. The equinox was March 21st, tomorrow is the first full moon since then, and Sunday is Easter. In the Jewish calendar, today is the day that the 28 cycle that marks the intersection of the solar and lunar calendars. It’s a day for blessing the sun. A good day for spreading goodness and peace—something all religious faiths endorse--so I offer you my blessing. Here in NYC, the sun is hiding behind the clouds—which are intermittently spitting (a light mist) and flurrying. And it’s Cold!—April is the cruelest month—and today is a cruel day.. gone is warm sunshine and promise of warm days to come.. instead, April is flirting with winter! Hurry back sunshine! Last week, (Tuesday) I was finishing up the Mast Socks. Wednesday,(past) I started my simple socks in the new Lion Brand Sock Ease. Today they are 6 inches long, (that is there were 6 inches long at 7 am) By tonight, I expect I’ll be an other inch and half longer, and I'll be ready to start the flap! Little bits, of other knitting, are getting done… (My deadline looms!) --the weather has interfered --I need good light, and lately the weather has been all April showers! And I am working on a multi-part tutorial—mostly because I am lazy. There are times when I want to share, I feel like a vessel full of knitting information—Overflowing! I feel compelled to share with others, all that has been so generously shared with me. But I if I set up a good tutorial, I can point beginners, (with their repetitive beginner questions) to my tutorial—and feel good about. I can feel I am helping them--with out going over the same thing, time and time again. (If they don’t like the way I’ve presented the information, they can look else where!) But at least I know I have tried! It’s a bit self centered to point people to my blog. BUT—well, I am a bit self centered. But I learned most of what I know, not from classes I paid for, but from aunt (real and honorary) from Grandma’s, and Bubba’s, and Nana’s –Not all my own, but a host of women who made me part of their knitting family. But I also know, however that some of us, don’t learn well in isolation, or from reading. We need instruction and interaction. We need to see what we are going to do, before we start, To see what we are learning being done; to hear about it; to do it. We need to watch others do it, and to help them—or at least, be able articulate what we are doing, and get (immediate!) feed back. And a class is the best way to meet all these needs. And I am very happy to be paid to teach! I haven’t mentioned that in a while, and when a subscriber tagged me... Well here it is. I am supposed to tag 15 people--if you want to be in this meme, consider your self tagged. 3. DO YOU LIKE YOUR HANDWRITING? –my formal writing? YES. My casual writing (it’s illegible!) is ok.
4. WHAT IS YOUR FAVORITE LUNCH MEAT? I don’t eat meat at lunch time much—but lately I have been hankering for a nice liverwurst sandwich on rye with fresh onions. 5. DO YOU HAVE KIDS? 2—both grown, and doing well. My son (& his family) in California, by daughter lives a few miles away. 6. IF YOU WERE ANOTHER PERSON, WOULD YOU BE FRIENDS WITH YOU? Yes, I think so. 7. DO YOU USE SARCASM? Yes, (and I sometimes, I think I should feel guilty about it, but I don’t). 8. DO YOU STILL HAVE YOUR TONSILS? Yes—its not a great body, but its intact. 9. WOULD YOU BUNGEE JUMP? No –I’ve used bungees a lot, and have seen them fail! I would never trust my life to a bungee cord. 16. WHAT IS YOUR LEAST FAVORITE THING ABOUT YOURSELF? I am too hard hearted. I need to be more generous, especially in spirit. 17. WHO DO YOU MISS THE MOST? Living? My sister Geraldine (she lives in Tokyo, Japan) Deceased? My friend Joan, who was like a mother to me. 19. WHAT COLOR PANTS AND SHOES ARE YOU WEARING? A skirt (black) and tan shoes. 21. IF YOU WERE A CRAYON, WHAT COLOR WOULD YOU BE? Purple. 26. HAIR COLOR? As a child it was blonde, but it faded to a dishwater (ash) and now it going grey… A nice silver grey, but still some dark ash so it’s a sort of salt and pepper. 27. EYE COLOR? Blue --pale, icy blue. 28. DO YOU WEAR CONTACTS? I can’t stand the idea of putting something into my eyes. 29. FAVORITE FOOD? All! I especially like spicy foods—Asian, Indian, Mexican, African, and other spicy cuisines. 35. MOST LIKELY TO RESPOND? I don’t care I think memes like this are trite. 37. WHAT BOOK ARE YOU READING NOW? Nothing! I finished In Defence of Food, (Michael Pollen), last week. I have Angels and Devils (Dan Brown) to read, but haven’t started it yet. 39. WHAT DID YOU WATCH ON TV LAST NIGHT? Law and Order (I am addicted to these shows). 40. FAVORITE SOUND(S). Music—just about every kind, (except jazz) City sounds; traffic, sirens, trains clacking along the tracks, horns (not too often or too loud!) and the sounds of nature. 41. ROLLING STONES OR BEATLES? Either/neither. 43. DO YOU HAVE A SPECIAL TALENT? Aside from my general brilliance? No. Being brilliant is enough. 44. WHERE WERE YOU BORN? New York Hospital(68th and 1st), NY NY. Remember the image of the balls of yarn? It looked like I had absconded with yards and yards of yarn—(the lemon drop yellow colorway.) from the Lion Brand Studio. But the lemon drop ‘ball’ was all air, and the taffy –an all too solid cake from the ball winder. A dozen and half rows of lemon drop--and it’s more than half gone! But it’s done its work. Latvian braid (after the Latvian twist and joining into a round.) with the 2 colors of yarn. The braid has interesting look--the color changes in the yarn changes the over all effect of the braiding (not to mention the blurring effect of having 2 very similar colors work their way together—which makes the braid even less evident) --I know, I know, the image is drab--blame it on the grey raining skys.. I'll take an other photo tomorrow or on Sunday.. with brighter light... and you can see everything better then. Just look at these lovely little acorns! Last night I cast on my Lion Brand Sock Ease sock—You might ask; What about the Pink socks you’re supposed to knit for your daughter? Well Tuesday, at the LIC knit meeting, Kim (blog less Kim) offered to loan me a book with a sock pattern (for pink ribbon socks)—that also includes some patterns for illusion knitted pink ribbon wash clothes--and other Think Pink patterns. But I won't have the book till next week, and I have to have something to knit in the meanwhile! And instead of getting a scant 2 rounds done on the way home, (the lace pattern wasn't hard,but it did involve 3 sets of Center raised decreases, and a K/YO (7 times into 1 stitch) every seventh row. Which is slow going one a moving train with size 2 needles. I will easily get twice as many rows done with plain knitting—and will make short work of them. Oh wait, russet is also a color name--and these leaves are really to bright to be russet--but it is a fun bit of word play! And yes, the leaves are knit and tacked in place, and looking good. Inside the sock, ends have been woven in, as well; all the ends except for the tail where the acorns should be sewn on. Oh, right Acorns--there are supposed to be acorns. 3 dimensional acorns hanging from the I-cord tail. They are on the needle (A LIE—the stuff I started last night, I don’t like, and will be frogged-- all 10 rounds. )Let’s see, a cast on of 4, with 3 increase rounds… Minute’s worth of work! But I am happy with the oak leaves—and the socks in general. And I will have months to enjoy them before I wear them! I am so confident about getting the acorns finished today—that last night I divided a ball of Lion Brand Sock Ease (the taupe grey color called Toffee) and packed it in my bag for something to work on the way home. The last time I was at the Lion Brand Studio, I reeled out a few yards of the Lemon Drop sock yarn—Just enough for a bit of contrasting color on the cast on edge and cuff—the toffee is grey with a bit of yellow and light brown highlights. The Lemon drop color way is mostly yellow (a bit brighter than the yellow in the grey yarn) with light brown and green highlights—2 shades of green—a bright spring green, and grayish olive green. I think the colors pair up nicely. 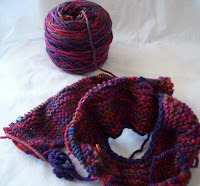 One of the features of the Lion Brand Studio is cones of yarns to experiment with—I am experimenting mixing the colors!